A mudroom usually refers to the threshold between the great outdoors and the inner sanctum of your living space. It’s usually not accorded much thought, let alone design. But since this space is an entry that is used most frequently by you, your family, and many visitors, think about a mudroom makeover that converts an afterthought into a more functional, appealing area in your home. Here are some remodeling ideas to jumpstart your thinking. 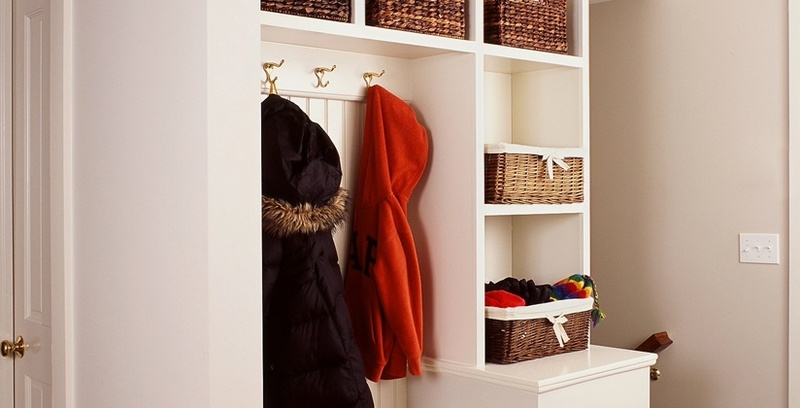 Built-ins like shelves, cubbies, racks, and a bench can reduce the clutter of coats, shoes, backpacks, and other items that are usually tossed aside in the mudroom. Assign a cubby to each child, designate shelves for certain items, and give each person their personal coathook. If you have a bench, you can use the underneath space for additional storage, with drawers or even bins on casters that roll in and out. Kitchen cabinetry also works well in a mudroom makeover. A pantry cabinet can double as a broom closet or coat storage. Base cabinets can store shoes or backpacks. Hutch-style cabinetry provides easy organization in a mudroom—and looks great! Ceramic tile is durable, easy to clean, and affordable, and comes in a wide array of colors and patterns so you can customize your mudroom. Cork flooring is growing in popularity because it is attractive, durable, and very low maintenance. Cork is a natural insulator and also resists moisture, bacteria, and mold, making it an ideal choice for a mudroom makeover. Natural stone can stand up to any traffic and still look beautiful, when properly sealed. The colors and veining vary from one material to another, giving it a unique look, and you can choose from a rough surface to a highly polished one, and everywhere in between. Wood laminate offers the richness and warmth of wood with added durability to withstand heavy traffic. It’s also affordable and easy to install. Bamboo is a naturally moisture-resistant hardwood that is also very eco-friendly, since it comes from a highly sustainable grass. Bamboo flooring has rich grain and resembles finer hardwoods, but at a much lower cost. Remember that this area is a “room”. You wouldn’t overlook the walls in any other room makeover, and the mudroom should be no different. The walls of your mudroom should blend eye appeal with functionality. With all the traffic filtering through this area, your walls will get more contact than most areas in your home. Choose easy-care paint in a color that works with the adjacent areas or opt for vinyl wallcovering, which gives you the option to add patterns and texture with the added benefit of easy care. Wainscoting provides protection with style, and blends with many types of décor. Lighting is another important element in your mudroom makeover, and one that is quite often neglected. The space is used for preparing to enter or leave the home. You don’t need bright lights to tie your shoes or find your coat. Think about softer lighting or dimmers. 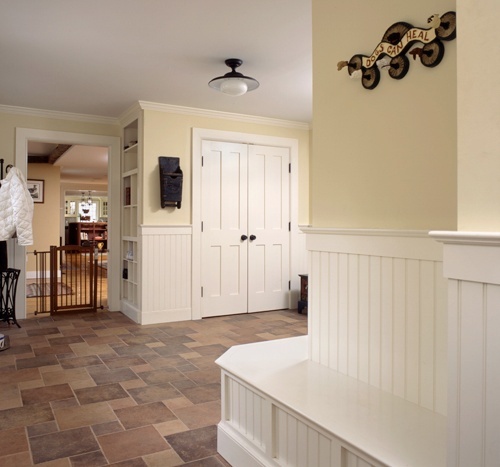 Add more stylish light fixtures to complement the design of the new and improved mudroom. 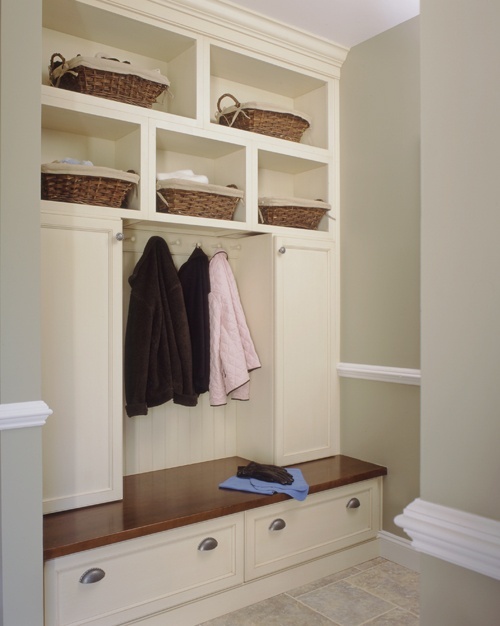 A mudroom is a vital area for keeping dirt and clutter out of your home. When designed properly, this room offers an attractive, organized, and pleasant entry. Talk with a designer at your remodeling company for more ideas to make your mudroom makeover a success.